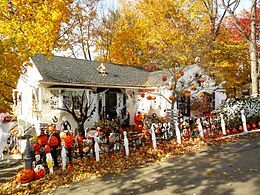 Halloween or Hallowe'en (a contraction of Hallows' Evening), also known as Allhalloween, All Hallows' Eve, or All Saints' Eve, is a celebration observed in a number of countries on 31 October, the eve of the Western Christian feast of All Hallows' Day. It begins the three-day observance of Allhallowtide, the time in the liturgical year dedicated to remembering the dead, including saints (hallows), martyrs, and all the faithful departed. 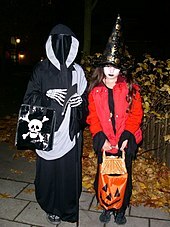 The word Halloween or Hallowe'en dates to about 1745 and is of Christian origin. The word "Hallowe'en" means "hallowed evening" or "holy evening". It comes from a Scottish term for All Hallows' Eve (the evening before All Hallows' Day). In Scots, the word "eve" is even, and this is contracted to e'en or een. Over time, (All) Hallow(s) E(v)enevolved into Hallowe'en. Although the phrase "All Hallows'" is found in Old English "All Hallows' Eve" is itself not seen until 1556. Today's Halloween customs are thought to have been influenced by folk customs and beliefs from the Celtic-speaking countries, some of which are believed to have pagan roots. Jack Santino, a folklorist, writes that "there was throughout Ireland an uneasy truce existing between customs and beliefs associated with Christianity and those associated with religions that were Irish before Christianity arrived".Historian Nicholas Rogers, exploring the origins of Halloween, notes that while "some folklorists have detected its origins in the Roman feast of Pomona, the goddess of fruits and seeds, or in the festival of the dead called Parentalia, it is more typically linked to the Celtic festival of Samhain, which comes from the Old Irish for 'summer's end'." 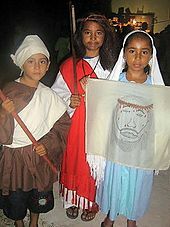 It is claimed that in the Middle Ages, churches that were too poor to display the relics of martyred saints at Allhallowtide let parishioners dress up as saints instead.Some Christians continue to observe this custom at Halloween today. 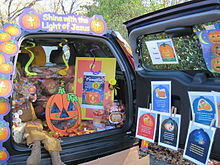 Lesley Bannatyne believes this could have been a Christianization of an earlier pagan custom.While souling, Christians would carry with them "lanterns made of hollowed-out turnips". It has been suggested that the carved jack-o'-lantern, a popular symbol of Halloween, originally represented the souls of the dead. On Halloween, in medieval Europe, fires served a dual purpose, being lit to guide returning souls to the homes of their families, as well as to deflect demons from haunting sincere Christian folk. Households in Austria, England and Ireland often had "candles burning in every room to guide the souls back to visit their earthly homes". These were known as "soul lights". Many Christians in mainland Europe, especially in France, believed "that once a year, on Hallowe'en, the dead of the churchyards rose for one wild, hideous carnival" known as the danse macabre, which has often been depicted in church decoration. Christopher Allmand and Rosamond McKitterick write in The New Cambridge Medieval History that "Christians were moved by the sight of the Infant Jesusplaying on his mother's knee; their hearts were touched by the Pietà; and patron saints reassured them by their presence. But, all the while, the danse macabre urged them not to forget the end of all earthly things." This danse macabre was enacted at village pageants and at court masques, with people "dressing up as corpses from various strata of society", and may have been the origin of modern-day Halloween costume parties. In parts of Britain, these customs came under attack during the Reformation as some Protestants berated purgatory as a "popish" doctrine incompatible with their notion of predestination. Thus, for some Nonconformist Protestants, the theology of All Hallows' Eve was redefined; without the doctrine of purgatory, "the returning souls cannot be journeying from Purgatory on their way to Heaven, as Catholics frequently believe and assert. Instead, the so-called ghosts are thought to be in actuality evil spirits. As such they are threatening." Other Protestants maintained belief in an intermediate state, known as Hades (Bosom of Abraham), and continued to observe the original customs, especially souling, candlelit processions and the ringing of church bells in memory of the dead. Mark Donnelly, a professor of medieval archaeology, and historian Daniel Diehl, with regard to the evil spirits, on Halloween, write that "barns and homes were blessed to protect people and livestock from the effect of witches, who were believed to accompany the malignant spirits as they traveled the earth." In the 19th century, in some rural parts of England, families gathered on hills on the night of All Hallows' Eve. One held a bunch of burning straw on a pitchfork while the rest knelt around him in a circle, praying for the souls of relatives and friends until the flames went out. This was known as teen'lay. The rising popularity of Guy Fawkes Night (5 November) from 1605 onward, saw many Halloween traditions appropriated by that holiday instead, and Halloween's popularity waned in Britain, with the noteworthy exception of Scotland. 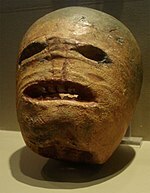 There and in Ireland, they had been celebrating Samhain and Halloween since at least the early Middle Ages, and the Scottish kirk took a more pragmatic approach to Halloween, seeing it as important to the life cycle and rites of passage of communities and thus ensuring its survival in the country. 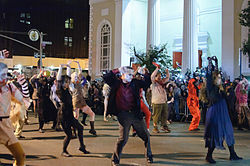 In England, from the medieval period, up until the 1930s, people practiced the Christian custom of souling on Halloween, which involved groups of soulers, both Protestant and Catholic, going from parish to parish, begging the rich for soul cakes, in exchange for praying for the souls of the givers and their friends. 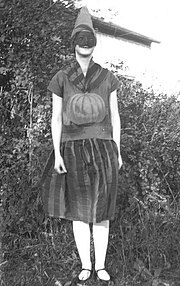 American historian and author Ruth Edna Kelley of Massachusetts wrote the first book-length history of Halloween in the US; The Book of Hallowe'en(1919), and references souling in the chapter "Hallowe'en in America". In her book, Kelley touches on customs that arrived from across the Atlantic; "Americans have fostered them, and are making this an occasion something like what it must have been in its best days overseas. All Halloween customs in the United States are borrowed directly or adapted from those of other countries". 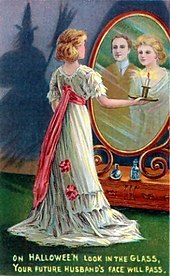 Dressing up in costumes and going "guising" was prevalent in Scotland and Ireland at Halloween by the late 19th century. A Scottish term, the tradition is called "guising" because of the disguises or costumes worn by the children. In Ireland the masks are known as ‘false faces’. Costuming became popular for Halloween parties in the US in the early 20th century, as often for adults as for children. The first mass-produced Halloween costumes appeared in stores in the 1930s when trick-or-treating was becoming popular in the United States. There are several games traditionally associated with Halloween. Some of these games originated as divination rituals or ways of foretelling one's future, especially regarding death, marriage and children. During the Middle Ages, these rituals were done by a "rare few" in rural communities as they were considered to be "deadly serious" practices. 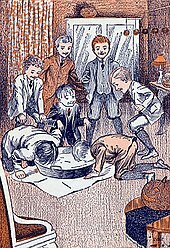 In recent centuries, these divination games have been "a common feature of the household festivities" in Ireland and Britain. They often involve apples and hazelnuts. In Celtic mythology, appleswere strongly associated with the Otherworld and immortality, while hazelnuts were associated with divine wisdom. 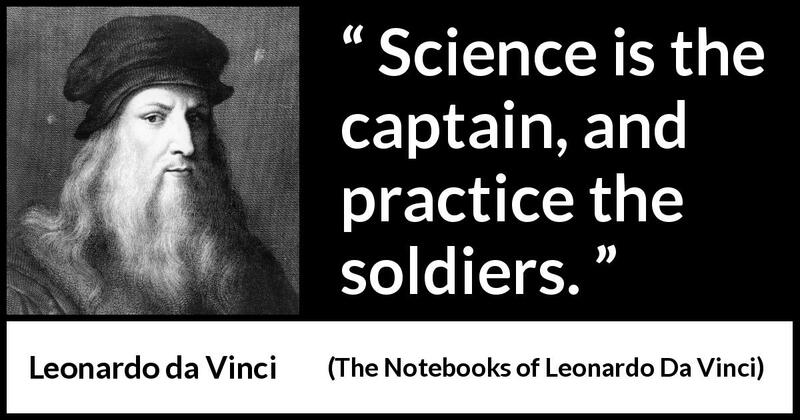 Some also suggest that they derive from Roman practices in celebration of Pomona. In Ireland and Scotland, items would be hidden in food—usually a cake, barmbrack, cranachan, champ or colcannon—and portions of it served out at random. A person's future would be foretold by the item they happened to find; for example, a ring meant marriage and a coin meant wealth. At one time, candy apples were commonly given to trick-or-treating children, but the practice rapidly waned in the wake of widespread rumors that some individuals were embedding items like pins and razor blades in the apples in the United States. While there is evidence of such incidents,relative to the degree of reporting of such cases, actual cases involving malicious acts are extremely rare and have never resulted in serious injury. Nonetheless, many parents assumed that such heinous practices were rampant because of the mass media. At the peak of the hysteria, some hospitals offered free X-rays of children's Halloween hauls in order to find evidence of tampering. Virtually all of the few known candy poisoning incidents involved parents who poisoned their own children's candy. On Hallowe'en (All Hallows' Eve), in Poland, believers were once taught to pray out loud as they walk through the forests in order that the souls of the dead might find comfort; in Spain, Christian priests in tiny villages toll their church bells in order to remind their congregants to remember the dead on All Hallows' Eve. In Ireland, and among immigrants in Canada, a custom includes the Christian practice of abstinence, keeping All Hallows' Eve as a meat-free day, and serving pancakes or colcannon instead. In Mexicochildren make an altar to invite the return of the spirits of dead children (angelitos). 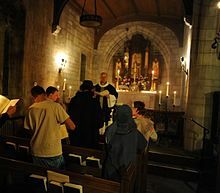 The Christian Church traditionally observed Hallowe'en through a vigil. 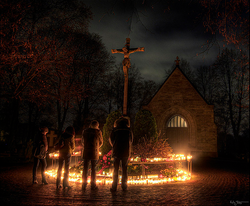 Worshippers prepared themselves for feasting on the following All Saints' Day with prayers and fasting.This church service is known as the Vigil of All Hallows or the Vigil of All Saints; an initiative known as Night of Light seeks to further spread the Vigil of All Hallowsthroughout Christendom. After the service, "suitable festivities and entertainments" often follow, as well as a visit to the graveyard or cemetery, where flowers and candles are often placed in preparation for All Hallows' Day. In Finland, because so many people visit the cemeteries on All Hallows' Eve to light votive candles there, they "are known as valomeri, or seas of light". Hindus remember the dead during the festival of Pitru Paksha, during which Hindus pay homage to and perform a ceremony "to keep the souls of their ancestors at rest". It is celebrated in the Hindu month of Bhadrapada, usually in mid-September. 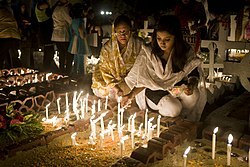 The celebration of the Hindu festival Diwali sometimes conflicts with the date of Halloween; but some Hindus choose to participate in the popular customs of Halloween.Other Hindus, such as Soumya Dasgupta, have opposed the celebration on the grounds that Western holidays like Halloween have "begun to adversely affect our indigenous festivals". There is no consistent rule or view on Halloween amongst those who describe themselves as Neopagans or Wiccans. 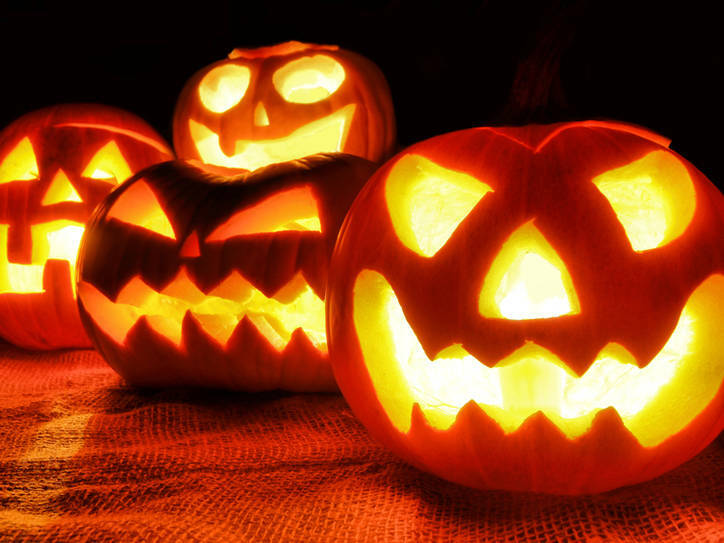 Some Neopagans do not observe Halloween, but instead observe Samhain on 1 November,some neopagans do enjoy Halloween festivities, stating that one can observe both "the solemnity of Samhain in addition to the fun of Halloween". 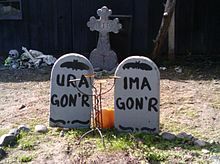 Some neopagans are opposed to the celebration of Hallowe'en, stating that it "trivializes Samhain", and "avoid Halloween, because of the interruptions from trick or treaters". The Manitoban writes that "Wiccans don't officially celebrate Halloween, despite the fact that 31 Oct. will still have a star beside it in any good Wiccan's day planner. Starting at sundown, Wiccans celebrate a holiday known as Samhain. Samhain actually comes from old Celtic traditions and is not exclusive to Neopagan religions like Wicca. 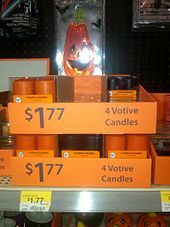 While the traditions of this holiday originate in Celtic countries, modern day Wiccans don't try to historically replicate Samhain celebrations. Some traditional Samhain rituals are still practised, but at its core, the period is treated as a time to celebrate darkness and the dead – a possible reason why Samhain can be confused with Halloween celebrations."